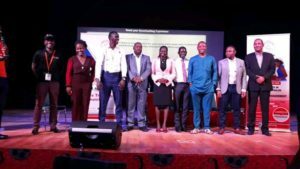 KAMPALA – Hundreds of sales and marketing professionals in Uganda have benefited from a two-day first Sales Warrior Convention that took place February 21 and 22 in Kampala. The event, the first of its kind in the country, aimed at equipping sales persons with cross-cutting sales techniques. It was hosted at the International University of East Africa, Kasanga in Kampala. Organised by Daniel Choudry Sales Institute, the convention aimed at building, training and mindset shaping of salespersons to help move their companies to the next level. It attracted salespersons from sectors including insurance, banking, hospitality, media, and education, among others. In attendance were renown speakers Nataliey Bitature, the co-founder and director Musana Carts & director at Handy Men, Amos Wekesa, a tourism expert and CEO of Great Lakes Safaris and Uganda Lodges, Daniel Choudry, Aisha Ali founder of I – Profile Foundation, Michael Mwesigwa, the head of sales coordination at Bank of Africa, and Chinonso Ogbogu, the executive director of TheIncubators Academy and Sabi writers in Nigeria. Others were Jean Byamugisha CEO Uganda Hotel Owners Association, Herbet Odankie Mucunguzi, country director Kwese Free Sports, Maggie Mukiibi Lutwama, a coach and business strategist, Dr. Emeka Akaezuwa Vice-Chancellor International University of East Africa, among others. Speaking about the event, Daniel Choudry, the founder of the Sales Institute, said: “The purpose of this sales convention is to create all round sales personnel with various skills, sales projection, performance formula, having working teams, personal branding, among others.” He asked salespeople to provide solutions to clients. He urged business owners to embrace the programme by enrolling their staff to enable them to build capacity at the same time improve and grow sales for their companies.